Sea trout season is closed in Tampa Bay, St. Petersburg, Clearwater and anywhere in Florida south of these areas from December1st through the end of January. But, we’re fishing in Pasco county right now (Tarpon Springs and New Port Richey) and the trout season is open until February 1st. And… The trout fishing is getting really good. I’ve had charters for 10 out of the last 12 days and we’ve had some days with 75+ keeper size or better trout making it to the boat. Where we’re catching them until February, you can keep 5 trout per person and they must be between 15″ and 20″. 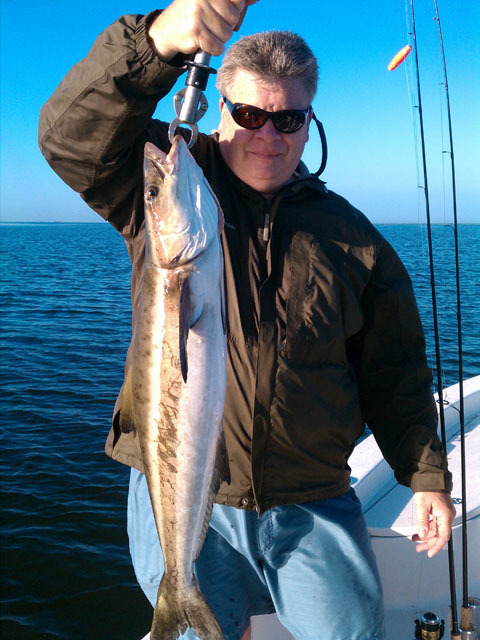 However, one of your 5 fish limit may exceed the 20″ mark. Sea trout eat all manors of bait fish and artificial lures including great strikes on top water baits. The smaller ones tend to jump and thrash on the surface and the larger fish will bulldog you and even pull drag off the reel. Strikes using jigs are pronounced, hard thumps similar to a bass. You can’t mess up when cooking a speckled sea trout. They have a very white, flaky, non “fishy” tasting meat. You can fry them, bake them, broil them or grill them Use your favorite seasonings and your sure to be thrilled with the result. I prefer them fried but that’s just the southern boy in me. Redfish were on fire two weeks ago and something changed a bit. We’re still getting a few and it has gotten better in the last few days but the numbers are down compared to two weeks ago. The more consistent weather that is forecasted should lead to more fish. Fish from 2-10lbs have been caught this week and we’ve been getting 2-8 a trip in the last week. Prior weeks we were getting 20+ fish a day averaging 8lbs but last weeks cold front put a halt to that. With the warming trend we’ve had in the last few days we’ve seen a better bite each day so look for the bit to get even better in the next week or two. We’ve also been getting some monstrous bluefish, a few nice spanish mackerel and even a couple of cobia like the one pictured in this report. Trout fishing it at the beginning stage of it’s peak season. It will only get better from here through March. If you like eating great tasting fish that strike as hard as a bass but fight better, this is your time of year. Redfish are a great addition to a trout focused trip and we’re catching them pretty regularly. Everything else is just gravy. We’ve had a hard time going out and catching less than 7 or 8 species of fish so now is a great time to get out on the water. It’s not to hot or cold outside, it’s just about perfect so if you’re ready to catch some fish, give me a call.